"On Writing" was one of the best books I've ever read on being a writer. It was so interesting. It's been a few years since I read it. I should go back and do it again. Wow. I'm definitely going to read that book. Great quotes. Brilliant book. Read it in a couple of days after I got it for my birthday. Highly recommended! I agree with the above, like King or not that little book has more useful advice about writing than any that comes to mind. I enjoyed that book and wouldn't mind reading it again. "On Writing" is fantastic. My favorite part was how he ended up moving his writing desk away from the center of his study room - essentially making it less of a priority than his family. I loved that because you don't get a lot of artists who speak in defense of having the people they love as their center. 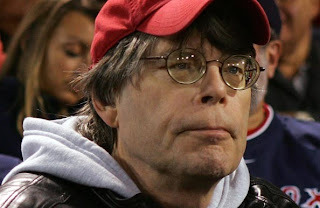 In fact, I know more than a few writers who scoff at social outings because they want to write instead - but Stephen King finds a good balance between the two. I love Stephen King's On Writing.